Within Costa Rica’s hundreds of acres of lush tropical rain forest, there are plenty of amazing plants, wildlife, and especially birds. 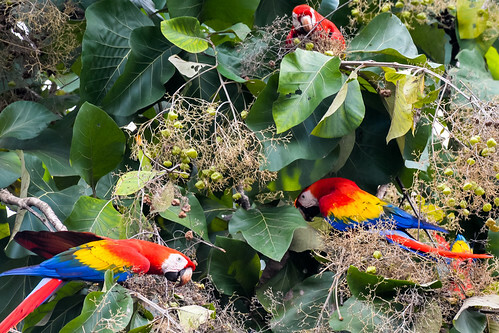 There are bird species living in Costa Rica that you won’t see in any other part of the world. Because of this opportunity to see unusual birds, bird watching is a popular activity in Costa Rica. One of the best spots for bird watching is at Hacienda Baru in the Dominical area. Hacienda Baru is a National Wildlife Refuge and Lodge located just north of Dominical on the Pacific coast. It is comprised of over 800 acres of protected land and includes a wide variety of habitats. Within Hacienda Baru and the adjacent areas, 330 different species of birds have been identified. One of the best ways to enjoy bird watching at Hacienda Baru is to participate in one of the guided bird watching hikes. Guides have local knowledge and can take you to the areas that have the best bird watching. They also know how to spot the tiny birds, so that you won’t miss anything. The best time to do your hike is early in the morning. This is when the birds first become active, so it gives you the best opportunity to see them. But don’t worry, you’ll be offered fresh coffee to help wake you up! The Lowland Bird Watching Hike begins at the Hacienda Baru Biological Research Center. This location is one of the best spots for seeing many different types of birds. You’ll have the opportunity to see toucans, honeycreepers, spotting tanagers, vireos, and saltators. On this hike you’ll have lots of chances to take photographs, so it’s perfect for someone wanting to practice their photography techniques. The path of the Lowland Bird Watching Hike travels from the Research Center down to the rookery. There is also plenty of other wildlife in the Hacienda Research area, and a great spot to view them is at the rookery. You can expect to see egrets, herons, and ibis as well. After you’ve had a chance to take photographs from the rookery, the path moves along the mangrove, and then loops back to the Biological Research Center. Guests can enjoy having a good breakfast at the Research Center when they return, which will provide needed nourishment for the final leg of the journey. The last section of the Lowland Bird Watching Hike includes another portion of forest, as well as the beach. The three kilometer stretch of beach at Hacienda Baru is beautiful, untouched and usually deserted as far as the eye can see. At the beach you’ll have the opportunity to see different shore bird types, such as sandpipers, plovers, phalaropes, whimbrels, pelicans, sanderlings, and frigatebirds. If you are lucky, you may see evidence of turtle nesting too. After an enjoyable visit to the beach, you can return to the Research Center where there are washroom facilities. If you are looking for a different kind of guided tour, you can try the Rainforest Bird Watching Hike, which will take you past old cacao plantations and right into the rainforest. It’ll take you about two hours to hike up to a campsite where there are plenty of bird watching opportunities. You’ll see birds that forage through this particular habitat. In this region you’ll have a chance to see some birds that are harder to spot, such as motmots, trogons, antshrikes, manakins, curasows, and more. Hacienda Baru is one of the best spots for birdwatching in Costa Rica. Don’t miss it next time you are in the Dominical area! And if you’re interested in seeing some of these birds right outside your house, contact Dominical Real Estate today.